Everyone who participated in the competition (so long as you didn’t cheat!) will receive a 2014 House Depot Badge for your AQWorlds Character Page. Please be patient while award each badge as it will take us several days to complete the process. The winners in the below categories will receive special prizes in addition to their Badge. Let’s see if you won! This was a tough one. So many amazing submissions and we could only choose 1 Grand Prize Winner. But we couldn’t pick just 1… so we have 2 Grand Prize Winners! Tired after a plunderin’ day? Drop anchor on ye’ TreehouseShip, Matey! All the amenities of a true Pirate’s Life at ye’ hooks: white sand at ye’ peg-leg, peaceful quarters, convenient hangin’ point on your Crow’s Nest an’ 100 miles to Tortulgar Inn only! Yarrrr! The house of the Stars, this structure is the remainder of an ancient civilization, Vita. Living knowledge of the cosmos is stored within its crystal shards. The entire structure is powered by the Stars gem at the top. These two houses will soon be created in AdventureQuest Worlds for everyone to enjoy. The players who created these houses will receive their creation for FREE, plus a bonus of 1,500 AdventureCoins! Woohoo! Glorious! Stupendous! Insert another adjective here! The following entries made it into our 2nd Place Winners, and for that, will each receive 500 AdventureCoins. And the awesomeness keeps on coming! The 3rd Place Winners will receive 250 AdventureCoins for their great submissions. Everyone’s A Winner in our Eyes! Thank you EVERYONE who participated in the 2014 House Depot Contest. Everyone at Artix is amazed at how talented you are, and as soon as we go through 500+ entries, you will soon see the 2014 House Depot Badge on your Character Page. Keep up the great work, and we hope to see your artistic talents in future contests! Love is a battlefield... and so is this Friday's release! Double Rep AND Double EXP Boost begins on ALL servers at www.AQ.com! Legend servers will get even higher boosts! Login this weekend to battle the Bluddrun the Betrayer, find Beleen's Valentine, and show the world how much you love to battle in AQWorlds! Replay previous Hero's Heart Day events! The Yokai Sunlord set leaves the Wheel of Doom, Dark Heartbreaker set arrives! Revontheus' Aphrodite's Woe P and E limited-quantity swords available at the Alydroid with pre-installed Azrael's Wrath core. New Home interface allows you to browse items for sale and in their own inventories more easily than ever. We will be awarding multiple prizes and home items with prize codes, making them more exciting than ever! Valentine's Day and Slimey Wormy Things! SnuggleFest 2014: What Does Igneox Say? It’s Snugglefest! Love is in the air....but for ElBhe, this holiday has only ended in disaster. This week, help him prepare for his date with his sweet little shadow vixen. But what would happen if Igneox were to find out about this date? 3 new items are coming to the Limited-Time Shop this week! The Block Zard and Lorelympian Torch will only be here for 2 weeks. Legion’s Curse will be here for the month of February and then gone forever! Next week Golden Giftboxes overflow with TONS of items from your favorite AE games! Beleen may have the best of intentions but, when you love mayhem, even the best of intentions can go wrong on the Love Ship! Happy Birthday to Blues, MechQuest's Specials Designer! Celebrate with the elegant Blues' Tech Blade, coming to a Birthday Shop in Soluna City. infiltrate the ShS cruiser in the "Rescue Braddock Steele"
Log in for the LIMITED TIME SPECIAL EVENT Saturday, February 15th 11-2, server time. You will have a 1 in 3 chance to encounter Richy the Rich Guy in the last battle of that mission! With all your newfound riches, go back to Soluna Main to the Brickity shop for a new Blockity-style back arm cannon. The Artix Entertainment team filled Faith's Truck with bags full of wrapped presents from HeroMart and headed to the Children's Hospital to give them out. It was the best start to a day... ever! A lot of the team dressed up, and the young people we visited were certainly entertained! The Hospital's staff took us room to room. Nythera and Faith had Santa buckets full of candy, then those of us carrying the sacks of gifts (each one containing gifts for a certain age... HeroMart does not have anything for children younger than 4, so we were sure to buy a bunch of plush toys and books for them) delivered a present appropriate for their age. The very first boy we met was a player of AQWorlds... and you should have seen the look on his face when someone recommended that he get me to sign his action figure, and he suddenly realized who I was. I hope all of the young ones we visited today had lots of fun. Battle on! For clicking the "READ MORE" button you get a bonus story. Past Saturday, we went to the MOSI (Tampa's Museum of Science and Industry) to talk to young gamers about making video games. The gaming event was sponsored by Verizon and was called "Press Play". We dressed in our cosplay armors and talked to visitors while Dage & Thyton did drawings by request. LOL, everyone kept asking Thyton to draw pikachu, ponies and unicorns. (Note: Thyton is a "tough guy" that draws hulking, wicked monsters... so it was humorous and inspiring watching him throw aside his machismo and and putting all 110% of his art skill into making cutsy things for the little girls. What a good guy!) We hope we made a positive impact on the young minds we spoke with... and are not sent any therapy bills for having Sepulchure chase the children while DEATH yelled "It is ok, you will respawn... really!" Achievement Unlocked: "Appear LIVE on the News without being in handcuffs"
Last Wednesday, we were on TV. FOX 13 News (Tampa Bay, Florida) featured our team and the Secret Underground Lab in a segment on the future of Video Games. Players were surprised to see how much the lab actually looks like the recreation inside AdventureQuest Worlds. (/join UndergroundLab) For the promo bits, we were asked to go to the studio in costume and be on camera LIVE. We were told we could do whatever we want while the field reporter Jeremy was talking -- we broke out into a Good vs Evil fight. The news segment should also be airing in Orlando tonight, and there is a small chance it could get picked up nationally. You do not have to wait though... Fox put the video of us in the news on their website for you to watch! "We are LIVE on TV... how about we just start fighting?" ..... "OK!" ......"Not so Fast Paladin!" I wish they had put the clip of when I pole vaulted using the axe and double drop kicked Sepulchure. We get a fair amount of visitors at the Lab these days. Watching how the artists draw the art for the games is really fascinating. Each and every week, a single AE artist must create an insane amount of monsters, backgrounds, swords, armors and items. View from the other angle! Nythera and the Player Support help fix hacked AQWorlds accounts (This is the room that answers your help emails!) They help about 4,000 players a week with their account problems. The focus of this news report was the future of gaming is changing. Just like CDs to iTunes.... Movie Rentals at BlockBuster to Netflix.... the way we buy games is changing. It is changing fast, and it is changing right now. Of course, it is not changing for us, we have been doing this for 10 years now. It has been odd watching the rest of the game industry making the switch to the way we have been doing things. That is... acquiring the games on the device you play them on, playing them for free and upgrading later (and optionally), and getting ongoing updated game content. A successful indie game dev studio!? Normally the word "indie" is met with thoughts of people squeazed into their garage working endlessly through the night on a sugar and stale coffee induced frenzy to create a video game before an impossible deadline. We have been at this for 10 years - doing new releases for you every single week. To show for it, we get to work in the fun and creative lab, endlessly through the night on a sugar and stale coffee induced frenzy to create a video game before our impossible deadlines. We love the lab and hope you will one day get to visit in person -- or maybe build video games with us! Of course, if anything ever goes wrong and we are building our games from a cardboard box with a modem connection... we hope you will come visit and make games with us too. BATTLE ON! Did you guys script that fight? We showed up at the FOX 13 studio at 9pm on Wednesday in costume. We were told we could do anything we wanted. The segment was going to air at 10pm, but they were going to do four LIVE clips promoting it. We are not sure why they were going to be LIVE... they could have recorded them. Maybe they were hoping we would do something supernaturally stupid. (We did out best!) The camera was setup just outside the studio under their giant doppler radar thing (for the weather.) Each of the live bits were going to be about 15 seconds. During the first one we were all standing and smiling, yelling "Battle On!" and then Sepulchure shoulder checked me. Everyone say it and we all drew our weapons. In the next segement it was an all out brawl. Miko was being chased around while Faith and Nythera squared off, and Sepulchure and I clashed weapons. The third and forth segements were my favorite... the camera man missed some of the best shots, but a girl was recording with her cell phone off to the side and got them. I will try to get the footage and post it for you. After the news cast the security guard said, "You guys need to take this show to the Childrens Hospital." O_O Nythera started making some calls immediately. Do you still love us knowing we are cheesy, crazy, game-obessed geeks in real life? Play the special event in our hit game AdventureQuest Worlds with musical guest One-Eyed Doll. In addition to having the premiere of the music video for "Committed", the band also created a special music CD just for our gaming community. The CD features songs that were used in our games. 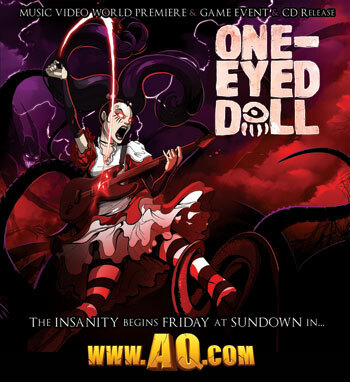 It also features a new song "Sally" based on the character Sally the Pretty Pink Necromancer in the DoomWood Saga that was voice acted by One-Eyed Doll's lead singer, Kimberly. It is available now and shipping world wide at www.HeroMart.com. Every 10 years, the dark forces become too overwhelming and the words from an ancient tome must be spoken in time, or the Dragon will grow a new horrific head for each of the mightiest monsters! That's where you come in, brave adventurers. Tonight, at 6pm our 10th anniversary event will begin in ALL of our major games. Join me here, as I give you the play-by-by, a live news feed of the last minute craziness as the team prepares to launch the event. 9:30am Secret Underground Lab online. 9:35am Artix reporting for duty! 9:45am Thank you to everyone posting anniversary/birthday wishes to the game network on Twitter. Words cannot express how heartwarming it is to see your encouraging words. Especially since we are doing something completely new for our special event. Doing new things is always scary... but you have always had our backs. Thank you for being part of this and for supporting us!!! 10:00am A team members girlfriend baked us banana bread this morning. But it was not cooked. I realized this after eating a BIG bite of it. It is still in my mouth. WHAT SHOULD I DO!? "Korin... erm.. here... wait, this isn't my bed...."
10:31am The judging of the AdventureQuest 3D Design a Monster art contest is now taking place! So many good entires -- this is going to be impossible. 11:00am Checking in with the game teams! Today's event will be spanning 6 games. This really is the first time we have tried doing this... only 7 hours left until launch! 11:30am Um... that was weird. Someone just ran into my room to tell me there is a black limo with an ebilcorp logo on it circling the building above the lab. Did one of you go all out on some sort of practical joke? 12:00pm The limo was gone before we could get a picture. So weird! Anyways, only 6 hours until the launch of the event! It is really cool seeing all the game teams pulling together for the same thing. HeroSmash is having some technical problems... nothing like having less than 6 hours to rewrite core engine functionality. Going to help! 12:30pm You know, for pretty much the past 10 years we have been doing non-stop weekly releases. Once we started, we never actually had a week go by without one. How funny would it be if tonight's 10th Anniversary event was "Surprise, no release!" LOL. Note: We would NEVER do that! We did do the opposite once though. Remember the week in DragonFable when the team announced they were just releasing a single fish. People were so mad! But when they caught the fish it took them to a surprise complete underwater zone. 1:15pm All game teams are reporting that they are close. That means... IT IS STORYTIME! What was your favorite memory from our crazy adventures together? The time Captain Rhubarb renamed 10,000 AQWorlds players's names to "Captain Rhubarb" and we had to declare a mulligan day? (A "do over day") ... or perhaps that time legendary AE artist and ninja Thyton (although he sorta looks like a Spartan. Like a... Spartan Ninja.) was creating the dragons for DragonFable and he showed them to and I replied, "Great! Now... let us go draw some GOOD Dragons." He was really hurt. He thought I was saying his dragons were bad and we needed to draw better ones. But what I meant was, he drew a bunch of EVIL looking Dragons and we needed to make some GOOD-GUY dragons. /facepalm. What was your favorite memory/story from our game community? 3:00pm Miko, when you see this -- please make sure the server hamsters get treats. We need them full speed for tonight's release! While we are on storytime, I would like to post probably the most interesting & controversial story from the business side of our gaming history. This story is 100% true. Back in 2007, a lot of big companies came trying to buy Artix Entertainment. A lot of people are shocked when they find out that I turned down a legit, written offer for $84 million. This actually happened. I love our games and our community, and I would never give it up for anything. Maybe this is why I am more proud than ever to be with you and the team are celebrating the 10th Anniversary today. There were a lot of battles back in those days that I was legally not allowed to share with you. Maybe one day I can write a book. But you have always had my back -- and we did ever get into trouble, I know that the team and I could count on you. Sometimes we say and do things in the "Artix Universe" that are fantasy. For example, we say that Geopetal, the game lead of DragonFable, is a rock. Of course in real life she is not REALLY a rock (she is a pebble.) Things like this are just plain fun. Well, fun as long as you play along that is. Sort of like an inside joke between friends. But it is funny how pretty much EVERY one of these inside jokes is based on something real. For example, before joining the team, the girl who is Geopetal was actually a Geologist. 100% true. Just something to think about. 5:45pm HAH! Now that is timing. The black limo with the Ebilcorp logo is driving around the building above the lab again. Hang on, I am going to go get you guys a picture... this is crazy! 5:48pm The elevator is in lock down. What the heck? Checking with Faith to figure out what is going on. All game heads reporting in! - EpicDuel is shutting down to install the release. - HeroSmash is preparing to shut down to install the release. - MechQuest & DragonFable & AdventureQuest are on Sandby. MechQuest & DragonFable & AdventureQuest are ready... no... wait... what the!? Lab Security system just went into lock down mode!? AQW Heroes Pay Their Debts... And this week, Death is coming to collect! When Death decides that he wants YOUR life, you agree to spend 72 hours filling his role so that he can experience what being a Hero is like. Learn how to rule the Underworld... and see just how well Death fills the role of a Hero. Open the Xhar Morghuil, the book of things which should not be named, but must not be forgotten and decide... Will you take back your mortality? Don't forget that October is the month for 4th Upholders! If you upgrade any time during October, you'll automatically be a 4th Upholder, gain TWO Chaotic Starswords, an achievement badge, and BIG bragging rights! If you have an upgrade which expires ON or AFTER November 1st, 2012, you are already a 4th Upholder! It is ALSO the month of Mogloween! Head to /mogloween to play our spooktastic release. The Chairman believes that you must dress for success. He proved that last week with his armor, but this week he's bringing 18 new EbilCorp styles (3 for each class and gender)! Can't decide which style to use? Purchase the new 4-key package that permanently unlocks 20 styles for each class and gender, including the sinister new EbilCorp styles! Log in now to catch up on past Mogloween stories! The Storybook is now available through the quest log. Can you get all the past masks before Croft reappears this year? MechQuest is 5 years old, and to celebrate, the Floorivator at Tek's Mechs has been fixed! Ride downstairs to the party! New this week - alongside your Wrapped Nubertrons, you can pick up accuracy-boosting Candle mods! Also - Star Captains can pick up high level Vintage models of the Volt Thorn mechas for Nova Gems. It's Taco Day! Scamp's Groceries has added some new stock for Taco Day: some items are permanent and some are rare, but you should check them all out! The city of Talados was once a beautiful island kingdom, the population extremely gifted in the art of psionics. But one day, that civilization fell to the might of a gargantuan abomination - an abomination named CARNAX! Carnax was eventually defeated, but the destroyed city sunk to the depths below. Now lying in ruins, you must journey through the remains to hunt for the pieces of the Taladosian set! Physically hunt -- that's right we are resurrecting the walk-around quest from the olden days of LORE! Also be sure to check out the new FallTide Dagger in the Limited-Time Shop, only available for the month of October!